Here is my newest, hot off the easel painting. I created this painting on site, over several visits, and refined it later in my studio. I selected this scene because of it’s unique beauty and ecological importance. It’s a Bioswale, and according to the University of California’s Arboretum in Davis, it provides some of the same benefits as natural wetlands. It creates habitat for wildlife, recharges ground water, filters pollutants and reduces runoff. It was pure joy standing in the middle of such a unique environment while painting.. I will certainly be back. Since today is Easter I would like to share a drawing of an angel sculpture. I did this drawing while sitting in the Sacré Coeur Basilica, Paris France. This is one of four angels that live high up in the central dome, one for each direction. I hope you enjoy and have a Happy Easter. 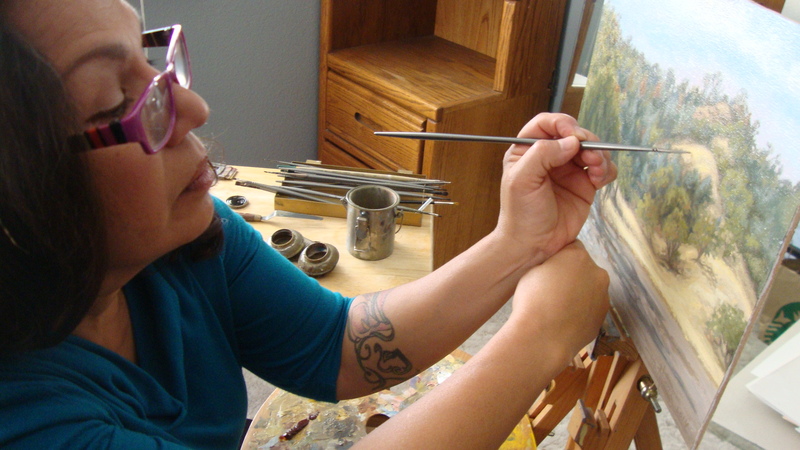 When its too hot to paint outside I enjoy the cool comfort of my studio. I use this time to apply finishing details on my previously created paintings, pushing myself to the absolute limits of my abilities! I find it enjoyable because it makes me relive the feelings I experience when studying nature for a new painting. This original 12 x 16 plein air oil painting was created in Capay, Valley California.